A couple of weeks ago, I met up with my oldest friend in the world to mind her three-year-old while she had her hair cut and dyed. As a reward, she said, she would buy me chocolate. Fine, I thought. I’m not a chocolate freak, so she’d be getting off rather cheaply, in terms of childcare. Of course, I had no idea what I was in for, chocolate-wise. 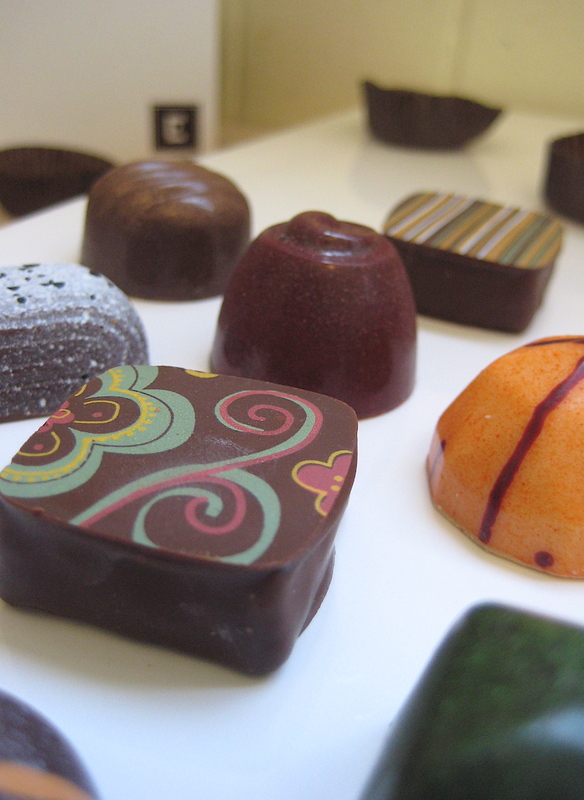 She took me to Christopher Elbow Artisanal Chocolates, at 401 Hayes Street. This woman has always out-cooled me. Even living in Redwood City with three small children pulling her in as many directions, she manages to know what’s going on right under my nose before I can sniff it out. Damn her and bless her, too. That is very much what happened to me when I bit into the caramel. Except I could feel port wine running down my throat instead of tomato soup. And, of course, there was no dramatic change to my organic composition which necessitated my immediate juicing. But I tumesced, just a little. Squid bought herself a box of nine chocolates ($20.00), which would last her nine nights. One before bedtime, like some sort of luxury sugar pill. I knew I’d be back to do the same. I hope she’s not placing them on her pillow in this heat. Upon my return, I chatted a bit with a nice young woman behind the counter and asked her to pick out some of her favorite chocolates. I added a couple of my own to the mix and had them wrapped to take home so that I might taste them in private, since my prior experience and reaction suggested I proceed with caution. Before leaving, I needed to sample a bit of drinking chocolate. 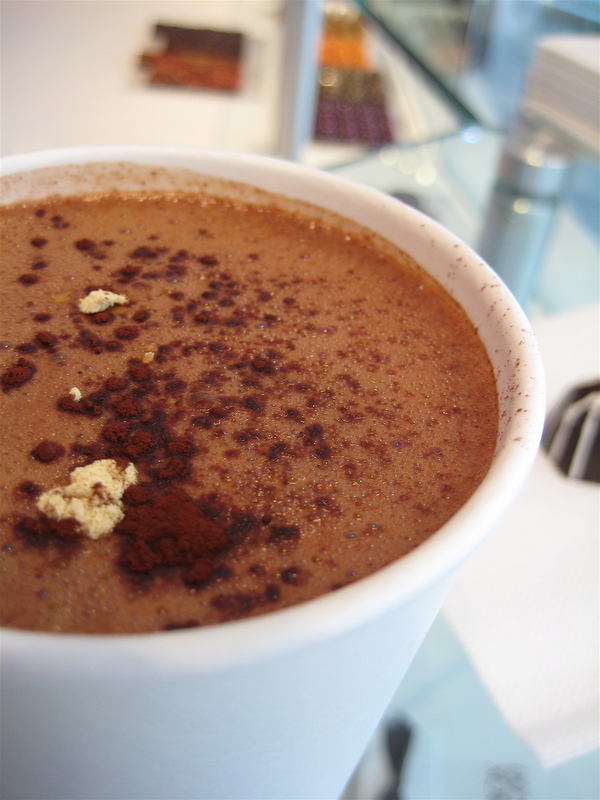 The young lady suggested her favorite– the Ginger Caramel Milk Chocolate. I obeyed. I took my chocolate into the drinking lounge and contemplated my impending sugar coma. 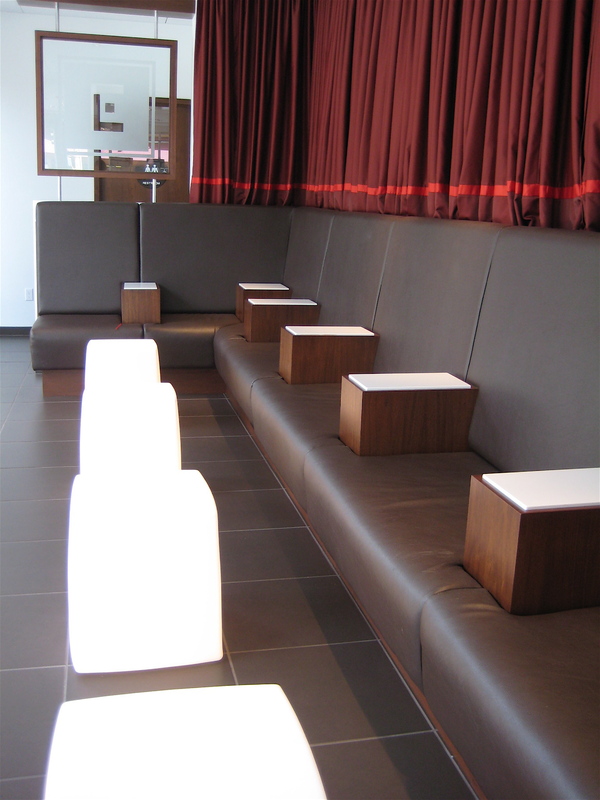 Though I was the sole human in the lounge at the time, it certainly didn’t feel, well, loungy. The upright seatbacks and hard surfaces of the armrest/places to put one’s beverage seemed to underscore the necessity of bracing myself for the sugar rush that was about to overtake me. The glowing tables unsettled me, reminding me as they did of the Milk Bar in A Clockwork Orange. I find the fact that this place has brought to mind two classic films from 1971 fascinating. Had a high-priced call girl in hot pants and a terrible shag cut sat down to join me, I might have drunk my chocolate faster. As it happened, I did drink my chocolate too quickly. I ended up inhaling a bit of ground ginger, which provoked an unfortunate little coughing fit. I knew the ginger was there, but I thought it looked pretty and therefore refused to stir it in. It was my fault entirely. I snapped some more photos and left, following someone I can only describe as a crazy, even more childlike Butterfly McQueen down Gough Street. She was exceedingly friendly, stopping to say hello not only to every person she met along the way, but a pair of shutters, and, finally, a hibiscus bush. Selfishly, I did not offer her any chocolate. When I arrived home with my chocolates, I realized I had neither the time nor the appetite to consume them then and there as I had planned. These were special chocolates– the kind one might savor while bathing in asses’ milk or worry over in a monkey fur bed jacket while digesting the latest gossip from one’s maid. They are luxurious and complex. They cry out for a momentary focus of one’s attention. They are an expensive mouthful, to be sure, but they are worth every penny, I promise. Cross my heart and kiss my elbow. Go check it out. Bourbon Pecan— one might never know there is marzipan lurking inside if one isn’t paying attention. Made with Maker’s Mark bourbon. Passion Fruit — I don’t naturally gravitate towards white chocolate, but it serves as a subtle carrier for a caramel so tangy with passion fruit that, if I were slightly more obsessive, I would become obese and diabetic from doing nothing all day but collecting hundreds of these confections, scooping out the caramel, and licking it off a giant antique wooden spoon. Cabernet— Chocolate, caramel, and Cabernet Sauvignon. I am not certain which winery supplies the wine for this confection, but I was assured it is a California Cabernet. As with the (sadly missing today) Port Wine chocolate I sampled a couple of weeks ago, I experienced another Miss Beauregarde moment. Happy-making. Bananas Foster— Enjoyable, but didn’t exactly scream Bananas Foster to me. Perhaps I should have set it on fire. Banana Curry— Hot damn. This one is really excellent. Refreshing trickle of heat. Rosemary— For some reason, sweets flavored with rosemary often have a subtle and mildly disturbing moldy flavor. This narrowly manages to avoid that sort of unpleasantness. Nice little salt kick at the end. Strawberry Balsamic— Fun. And interesting– the balsamic acidity of the piece is an interesting contrast to the chocolate but, rather than accentuate the strawberry, it obscures it. Orange Blossom Honey— Oh my Blossom Dearie. This one totally delivers. Salty caramel that allows the subtle orange blossom notes of the honey to peek through and say hello. I like you, you’re nice. Persian— Get over any loathing you might have of marzipan. This is a wonderfully complex piece of chocolate. Cardamom? Is that sumac? Do you even have any idea what sumac tastes like? Wonderfully nutty– blame the marzipan. 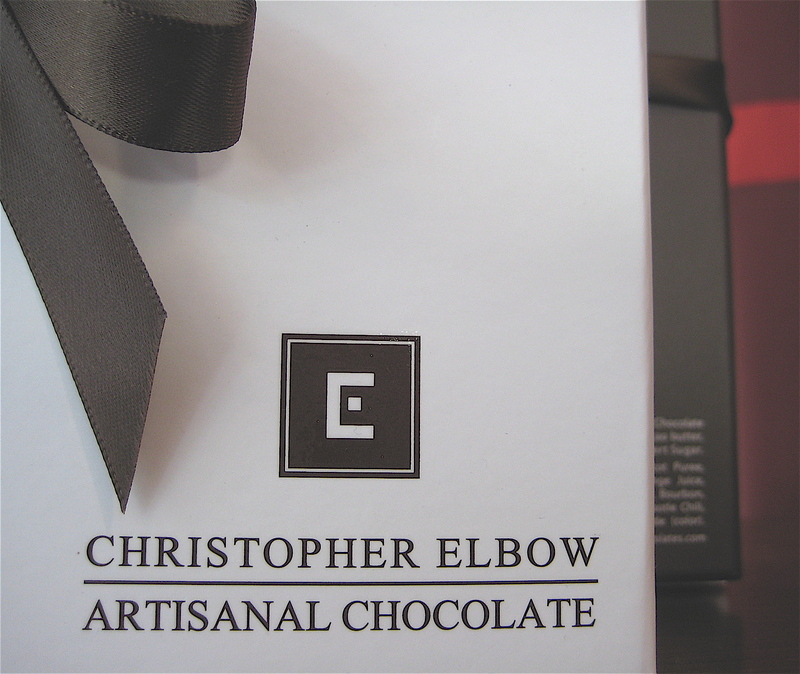 This entry was posted in Uncategorized and tagged chocolate, christopher elbow, Hayes Valley, michael procopio. Bookmark the permalink. There is some kind of bug in the universe that I’m still trying to understand, that prevents me from being informed immediately whenever a chocolate shop, artisan or importer opens for business within 25 miles of me. Instead I hear it from Squid, who points me here, and I waste a good 20 minutes reading Michael’s so-good-you-can-taste-it review, and looking at his excellent pictures. Damn. Now I have to go to Hayes Valley. 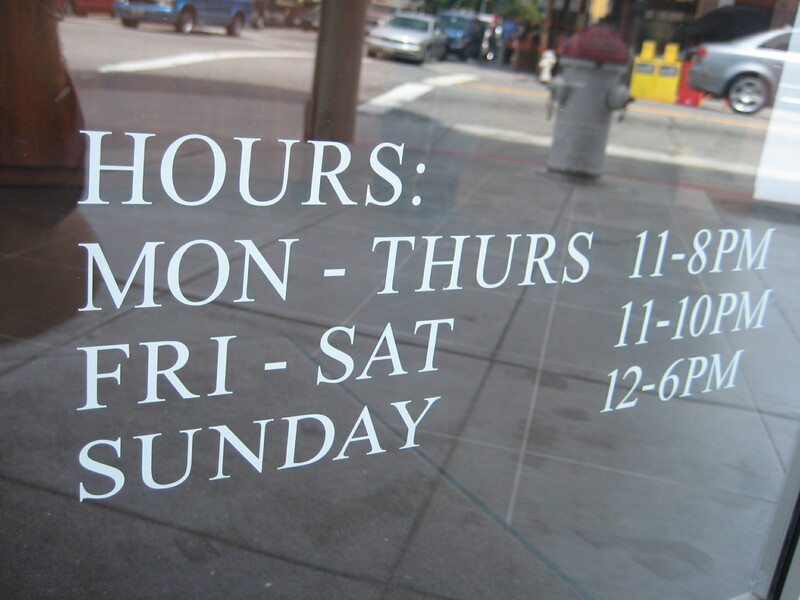 Yes, you do have to go to Hayes Valley now. I hear everything from Squid, too. And I”m very glad she pointed you to my site. Thanks for the compliments! I take the words of a professional photographer as very high praise indeed.